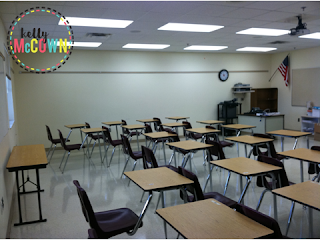 I have seen many pretty classrooms. Neat, tidy, bright, colorful, and all teacher made. Do the students benefit from a classroom environment that they create together with the teacher or one that is purely teacher made? I have found that students take great delight in creating the classroom environment with their classmates. They love to see their student work displayed where THEY put it. They love to see and MAKE sense of how the classroom is decorated and put together. For the past ten years I have used Word Walls in my Math classroom and the best technique I found was not buying one already made, but having the students create it themselves and FOR THEMSELVES. This simple technique allowed them to take ownership of the Math vocabulary and build upon it through their own learning process. This is a very simple version of a Math Word Wall. You can add color or different shaped sticky notes to your word wall. You can create more beautiful fonts or download my FREE version below. If you would like a FREE Copy of the Math Word Wall set of Words for Grades 3 to 8 CLICK HERE. 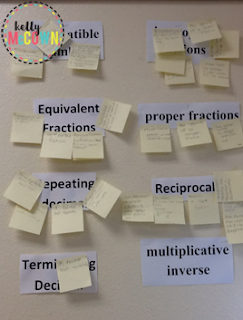 Included are all the instructions and vocabulary words to start your Math Word Wall today! Also I have available Interactive Math Vocabulary for Grades 3 to 8 Click HERE﻿. These are great for students to build upon past vocabulary and continue to grow and learn concepts on their own. This was a very important resource in my classroom. I used it every day! I referred to it daily, had my students actively engaged in building the word wall, and the best part was it was SOOO easy to do. I hope this resource becomes a very helpful tool for your students too!